My time on Utila was split in two chapters. Chapter one, spent with my cousins, was obviously about diving, but also about (responsible) debauchery and good family fun. Chapter two however, was to be about the slightly more serious sport of tec diving. 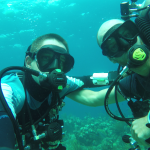 Tec diving is diving beyond recreational limits. Within those limits, should whatever happen, you can always come up to the surface with very little risks of developing decompression illness (DCI). In tec diving, if something goes wrong down there, coming up to the surface is often not an option and if it is, DCI is to be expected. In short, a screw up can very likely either kill you or send you directly to the hyperbaric chamber ($$$$). Well, I’m making this sound like risky business and it is, but while it will never be as harmless as recreational diving – and the tec diving manual really insists on that fact – it can be made pretty safe with good training, experience and equipment. I’m saying this in retrospect, everyone you meet (that is not a tec diver) and everything you read make the sport look like pure madness but in reality it’s nowhere as bad as it sounds and just like any other extreme sport, most casualties arise from human stupidity (not errors: careless risk-taking). It’s like skydiving in a way (albeit a lot more complex), where the gear and the procedures have been optimized to the maximum and very rarely become a failure point in chain of events leading to accidents. But just as in skydiving, error chains are short; few mistakes can get you killed whereas in recreational diving, you’d have to get a lot of things wrong before you become a casualty. Understandably, equipment and procedures in tec diving are much more complicated than in recreational diving. Since surfacing is not an option, everything is redundant (you even have a second mask). In order to make the dive feasible, you also carry multiple gas mixes (typically air, pure oxygen and enriched air) so that’s two other tanks strapped to your sides on top of the two you already have on your back. All in all a lot of equipment and a lot of room for mistakes as switching to the wrong gas at the wrong depth could lead to convulsing underwater and drowning. Planning and preparing the dive is also an integral part of tec diving. Where in normal diving you generally just don you kit and go under, in tec diving the planning part is generally just as long if not more than the actual dive itself. You have to plan you decompression stops on your way up (3 minutes at 24m … 6 minutes at 9m … 15 minutes at 5m, etc.) and you also have to plan for contingencies such as going too deep, staying too long, loosing decompression gases and so on. Last consideration but not the least, it’s very expensive. The course itself was 1400$US for 9 days of training and single tec dives generally hover around double what two recreational dive will cost you, making an already very expensive hobby even more costly. So, why taking up tec diving if it’s more dangerous, more expensive more complicated and overall less enjoyable than recreational diving? There are a couple of reasons. First, the thrill of knowing that I’m 50 meters deep, that coming up to the surfaces would injure or kill me, but that I’m kept safe by equipment, training and experience and that whatever happens I’ll be ready and capable of handling it. Very intellectual I know… Second, it has made me a much better diver overall giving me in depth (pun-intended) knowledge of what happens and what’s involved when you go beyond the no decompression limit. Third, it’s a challenge. Not that I have a lot of experience in diving in general, but I’ve done enough of it so that going underwater on a normal dive, while fun, isn’t such a thrill anymore. Fourth, it give you access to dive sites that are normally out of bound for recreational divers. Since you can go deeper and stay there for a longer time, there’s more you can explore. Those are the reasons why I enrolled myself in a 9 days tec diving course with UDC on Utila. I should also add that I did not foresee any other time where I could do it in the coming years. I was traveling alone, had plenty of time, was on Utila (where the diving it cheap and good) and without my girlfriend, who incidentally is not into diving. Even if it will very likely be another couple of years before I get to go tec diving again, the conditions where too good for me to skip on the opportunity. 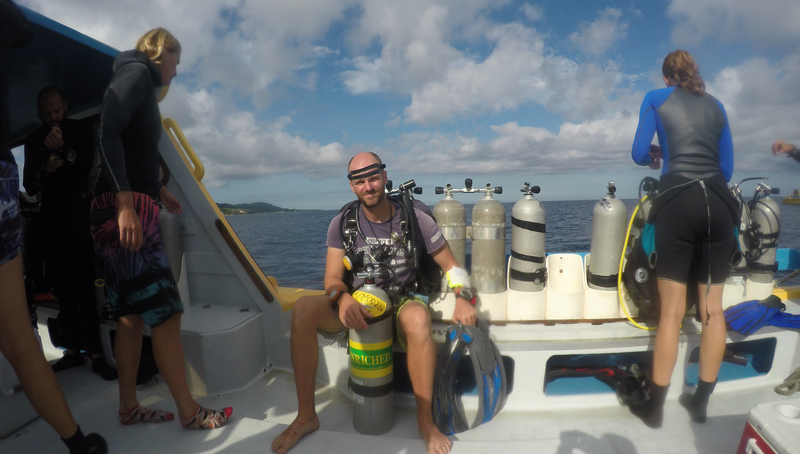 I had a couple of days in between the beginning of the course and my cousins leaving, which I spent diving with the crew at BICD. When the course started however, the better part of my days were spent over at UDC. The program was divided into three parts TEC40, TEC45 and TEC50 which you guessed were the depth limits the course would certify you to but there were also other restrictions. I had to go through a 300 pages manual before showing up for actual instruction so there was a lot of theory review before we even went in the water and when we got wet, the first couple of dives where done shallow to practice special procedures and emergency drills. It was only the last dives of each part that were decompression dives. TEC40 involved a dive at 40 meters but decompression could not be longer than 10 minutes and we were not allowed to carry gas blends of over 50% oxygen and also not allow to use them for accelerated decompression. TEC45 removed those limits and down we went to 45m with 50% and 100% oxygen (on top of the two air tanks on our backs) to make decompression faster. TEC50 took us (me and my instructor) to 50 meters with again 50% and 100% oxygen strapped to our sides. As mentioned earlier, the oxygen tanks are there to make decompression (coming up from the dive) faster but in our planning, we carry enough air on our primary tanks to complete the full dive plus the decompression on that gas only. To give you an idea, a 22 minutes dive at 50 meters requires about 40 minutes of decompression and ascent using pure oxygen and 50%. On air only, you’d be doubling that time and spending two hours underwater. I’m aware that not many people will share my excitment, but trust me, it was thrilling. I was alone with Scott, my instructor for the whole duration of the formation. He event showed how to do gas blending. It’s like I had to relearn diving all over again; every dive was a blast. 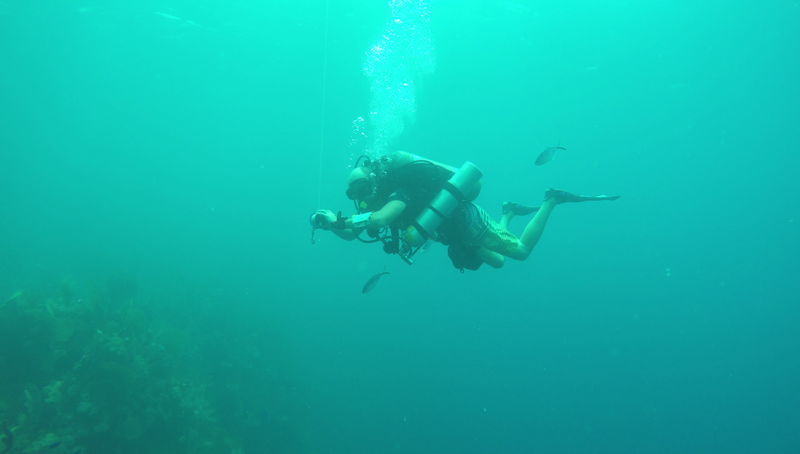 On top of the dives mandated by the tec diving course itself, I ended up doing three other tec dives. The first two were done on a day trip (an hour and half west of Utila) to the wrecks of Roatán and the third one I’ll get to later. Roatán is the largest of the Bay Islands and the more visited one. It has resorts, fancy hotels and is geared toward more conventional tourism while Utila caters to the backpackers both in budget and vibe. The diving, while good in Utila, is generally regarded as being better on Roatán, with larger and more abundant wildlife. Wrecks follow the same pattern. Utila has the Haliburton, a 100 feet freighter stripped and sunk to 30 meters to provide a playground for divers but Roatán has the Aguila and the Odyssey, which are slightly deeper (35 meters) and much larger ships. 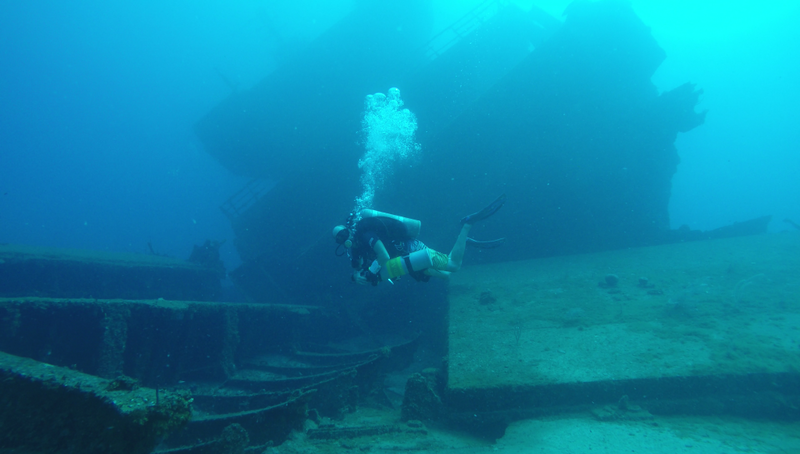 Visiting those two wrecks is entirely feasible in recreational diving configurations and that’s what the vast majority of people do but contrary to the Haliburton on Utila, you get to enjoy them a lot more if you are tec diving. Where other divers could only spend about 5 minutes at the bottom, Scott, Jake and I got to tour around for a good 25 minutes. On the Aguila, we even went inside the superstructure, spent a bit of time visiting the engine room and them made our way up the next floor before exiting though a door. Being around wrecks underwater, already an eerie feeling, gets even better once you get inside them. 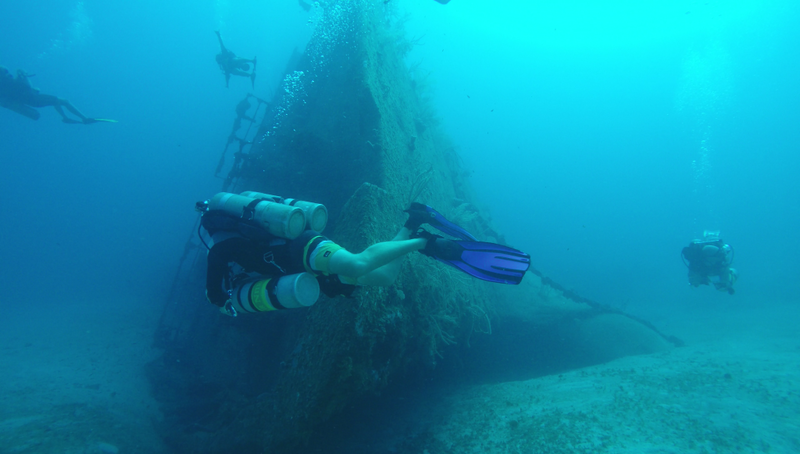 The lighting, the atmosphere, the marine life, the fact that you brain thinks your horizontal but your not since the wreck is not sitting upright all make for an out of this world experience. The two dives only took us to 35 meters, but since we spent so much time, it took us about 40 minutes to come back up. Once we were done with the diving, the boat docked to the island, we all went for a meal at a restaurant and on the way back to Utila, got into drinking games on the boats. 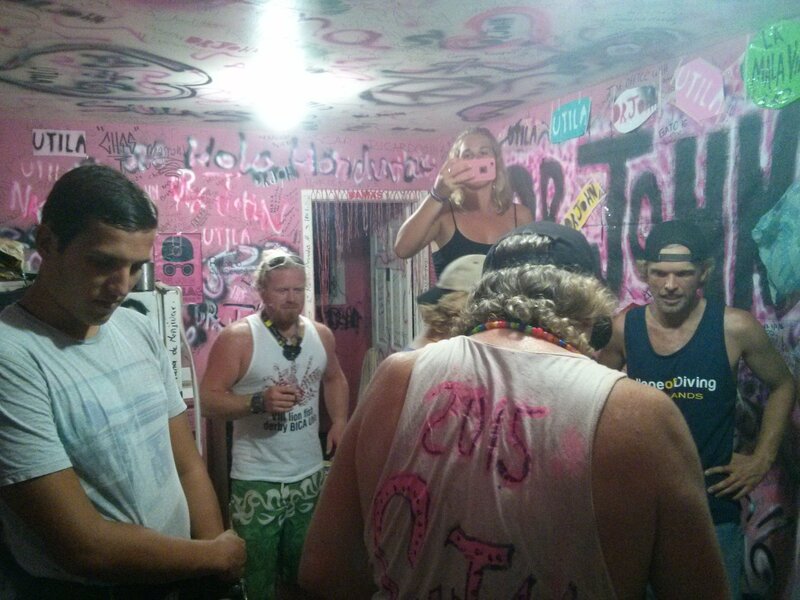 That night was Pancho’s going away party so I sobered up for two hours before going at it again with the BICD bunch. I went to bet a 4h30 am. Having woken up at 5 am to go to Roatán, I had almost made it round the clock. Tiring but worth it. While with my cousins, I had a more difficult time finding a connection with the people at BICD but once they were gone, the onus was entirely on me to get out there and be sociable so quickly I befriended most of them and got into the gang. The same scenario had occurred when I had visited Utila in 2013, where I had landed among people who had already been together for a couple of weeks. For the first few days, I felt sort of outcast but pretty soon (after a couple of drunken sessions) I was granted a place in the family. Relationship you have with other travelers tend to be short-lived and sort of disposable, but there on that island you spend enough time together to start building meaningful connections. One that I’ll commit to writing is with Jennifer, an English girl I ended up doing a lot of diving with to a point where she would call me her favorite dive buddy. Another one is with Jennah and Blake, an Australian-American couple with whom I had loads of fun. The day before my departure was spent doing the very last dive of the TEC 50 course in the morning and planning tomorrow’s tec dive with Bob at BICD. There were only two certified tec divers divers at BICD, Nick and Bob and some brand new equipment for a course that they were supposed to set up. 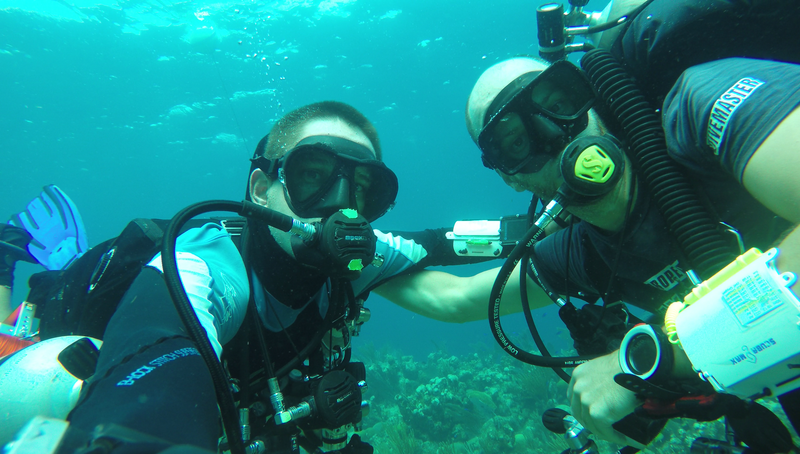 Nick, being the course director, was busy with teaching but Bob was more than willing to go on a tec dive. We spent the better part of the afternoon putting together our rigs, doing gas planning an filling bottles. When evening came, I went out for a couple drinks and got to bed quite early for a last night on the island, but I wanted to be in shape. In the morning, the weather was favorable so we made it to the North side. Bob and I were in the water quickly and thankfully got down without any problem. Thankfully I had to specify because there I was breaking an important rule of tec diving, which is not to do a tec dive in equipment you are not familiar with: you try it in shallow water first. The gear was brand new and top notch and the descent was fine, but as soon as we hit 50m, I got into a bit of trouble with my attitude as the wings were too large and air would shift to one side when leaning which made staying horizontal a pain. Restricting my movements did the trick, but it’s certainly something I should have figured out on a shallower dive. I was not the only one breaking rules that day though. On reaching the edge of the wall during descent, I could see streams of bubbles coming up from divers who were already down there, which I thought was odd because I was certain we had gotten under first and there were no other boats in the vicinity. 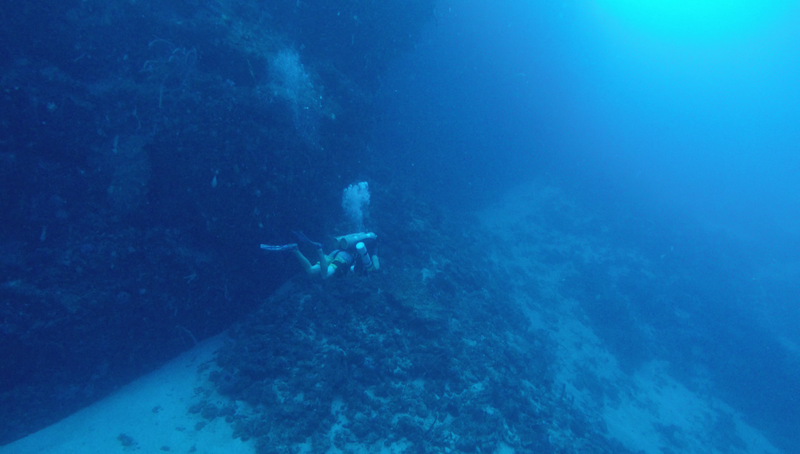 A few minutes later, while we were at 50m, I spotted a string of dead lionfish below us. Passed the corner, I signaled to Bob that there were to other divers in the distance at around 65m. On closer inspections, I noticed they were only wearing standard scuba equipment. They were on their way up and kicking frantically to get away from us and reach shallower depths as soon as possible. Later on on the boat, Bob confessed to me that it was two other instructors that had sneaked on a dive by themselves to go spear some lionfish, which in and of itself is glamorous thing to do but certainly not worth putting your life in danger over. At 65m, you only get a couple of minutes of no decompression time and that’s if you get catapulted there. 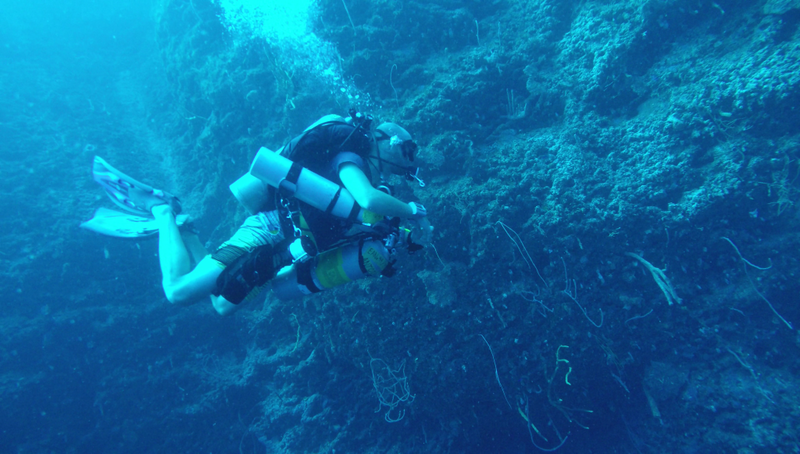 Realistically, there is no way to reach that depth and come back up maintaining a safe ascent rate on no deco limits so they certainly had to do a bit of decompression on the way up, which is bad and strictly forbidden in recreational diving. Still, a good diver will certainly manage that on a single tank, but what’s worse is that at 65m on air, you are under sever nitrogen narcosis, air is toxic at this depth and can trigger convulsions with no warning but the one thing that puts you mostly at risk is equipment failure, which at 65m, will likely get you killed. That’s why in tec diving, we dive with full redundancy and large gas reserves. With none of those safeguards and backups, the slightest malfunction may very well end up being fatal for you and your buddy (who will most likely try to assist and get in trouble as well). A regulator free flow at this depth will empty your bottle in two minutes, that’s not nearly enough time to do decompression reach the surface. I knew they could loose their jobs over this so I kept quiet as they were only endangering themselves. Back to Bob and I’s dive. At the planned time, we started ascent, did all our decompression stops by the book (or the tables should I say). Since the reef was deep on the site, we at to do the 5m stop (the longest) hovering in mid water, which made it quite a bit harder (and boring) since we could only use our gauges for reference. After an elapsed time of more than 70 minutes we emerged. Both happy and (mentally) tired, we fist bumped for a dive well done and climbed back on the boat where the rest of the normal divers had been waiting for us. They could go do another dive but since it’s advised to leave 2 hours between tec dives, we had to sit the next one out, which I took as an opportunity to take a nap. Back on shore, Bob kindly offered to take care of the equipment so I bid farewell to everyone, scrambled to my room to pack my things, went for some last baleadas and got on the ferry. Leaving Utila was again sort of heartbreaking. However, I was eager to come back home, start school, see my girlfriend and get back to life as normal. On the ferry, I met up with Eoin, whom I had met at UDC some days earlier and we tagged along all the way to San Pedro Sula and the next morning shared a ride to the airport. My flight back to Montreal made me connect through Atlanta for a good 12 hours and then New-York. With an open traveler’s mind, I took it as an opportunity to do a bit more tourism and got out of the airport and caught a train downtown to check out the city. Atlanta did no seem like much though I had a bit of fun walking among the hordes of disguised people that invaded the downtown core after DragonCon. Later after my walk, I settled at a bar for a couple of drinks and sparked incomprehension when I told the bar tenders I was from Canada. 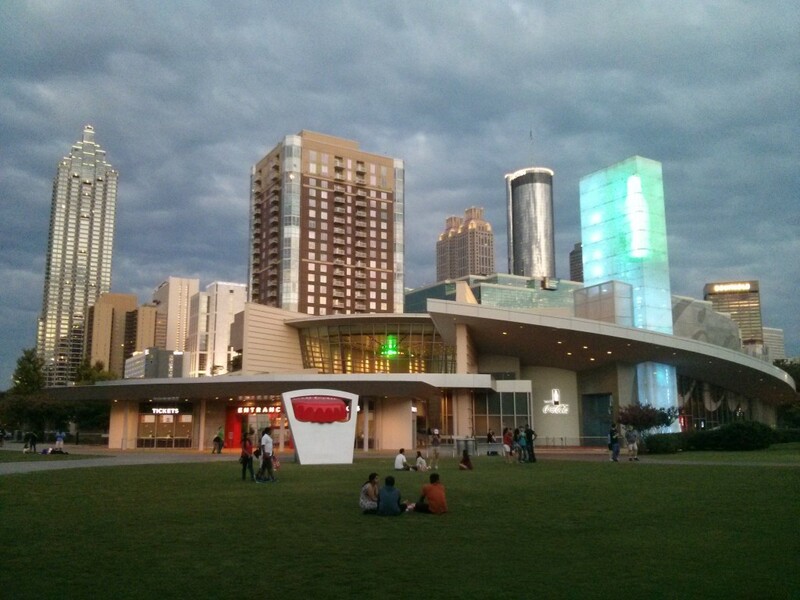 “Why would you come to Atlanta?” they asked me and on arriving back the airport around 3am and reminiscing through my evening that’s exactly what I thought: there did not seem to be much to this city. To be fair, I won’t make a proper opinion until I get to spend a couple days there and properly experience it, but my first impressions were leaning rather towards the negative side. Not wanting to end on that note though, I will recapitulate the objectives of this five week trip in Central-America, which were to see a bit of El Salvador, mainland Honduras, binge dive and do my tec diving course. By that metric, this vacation was a resounding success, with my favorite parts being El Salvador and obviously the technical diving. As for the rest, I think I’m getting too much used to backpacking around and have gotten too accustomed to the feeling and the highs it’s supposed to provide. Consequently, I think I’ll make the next adventure more adventure/goal oriented (read motorcycle) and/or travel more exotic routes. One thing that did struck me however was how mentally rested I was went I landed back in Montreal. During the last five weeks, I had completely disconnected from my life here and it even went to a point where I was eagerly counting the days until my flight back. 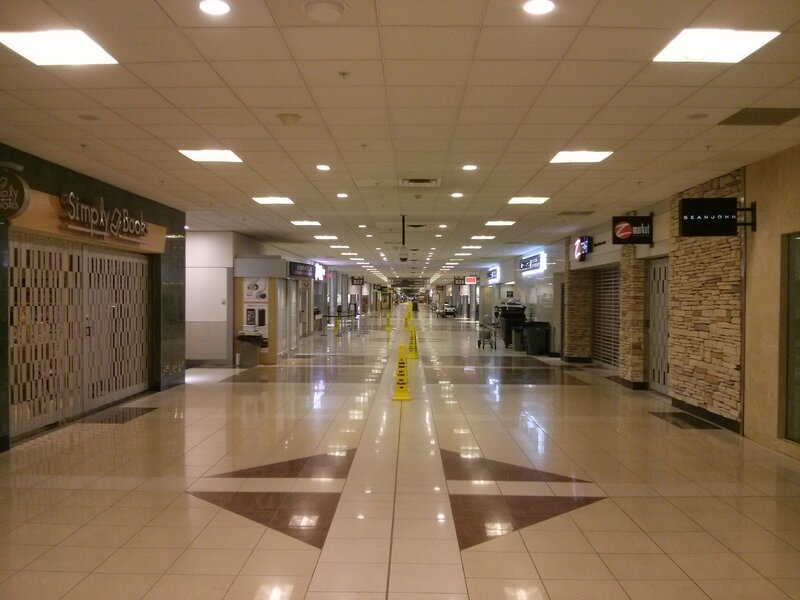 Such emptiness… being in airports at night is spooky!